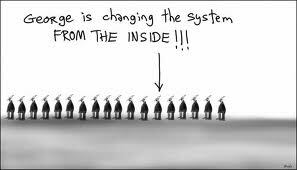 … trying to change the system from within.” Leonard Cohen. There is also a lively description by our friend Bob Russell of his years on the SFU Board of Governors, of which I am including a few excerpts. Having had considerable previous experience on SFU’s Board of Governors (BOG) as well as Senate, I have been fortunate to have had an inside look at the decision-making process within SFU. I hope that my personal observations will help shed light on how the problem lies not simply with the administrators themselves, but is systemic: the university structure has no adequate mechanism for the managing of the managers (the administrators). I strove to regularly inform my colleagues about the key issues and to bring sensitive ones to light. The first time I did so, I received what can only be described as a threatening response from an administrator, and it is difficult to say what effect it would have had on me had not the President, a strong believer in freedom of speech and open dialogue, come to my defense. Subsequent to that occurrence, even in the midst of heated exchanges and fundamental disagreements the senior administrators have treated me with the utmost courtesy and respect. Still, the challenges facing a faculty member on the Board were substantial. The majority of Board members come from the business community and have little if any knowledge of the traditional structure of a university; their access to information about the university matters is considerably filtered, with the result that they are generally naive about, and to a large extent kept naive about, the academic functioning of the university. For example, I recall once spending days preparing a document for the Board pointing out why many faculty would see problems with building options into Deans’ salaries which would give them a percentage of the finances they brought into the university through fundraising. While it stirred a lively debate between me and one of the powerful members of the BOG, I do not think that the Board as a whole ever appreciated the significance of the matter. While on the BOG, it was constantly emphasized by the Board’s secretary that we were dealing with confidential material and were charged with making key decisions dealing with the governance of the university as members of the Board without allegiances, and one was warned not to view himself as a “representative” of any particular constituencies. I always resisted such directives, emphasizing that my role was partly as a spokesperson for and representative of the faculty who elected me, having the responsibility to keep them informed where confidentiality considerations permitted. The group of BOG members who resist the temptation to rubber-stamp administrative requests was generally a small one, comprised primarily of those who were able to ask insightful questions — the members of the university community. As often as not, the important financial decisions were wrapped in a cloak of confidentiality which prevented one from bringing even important questions of principle to the broader university community. Some faculty members on the BOG feel a stronger sense of responsibility to their fellow faculty members than others, but it is reasonable for faculty who expect more accountability to be able to make informed decisions when voting for BOG candidates. While on the Board I made regular submissions on important actions undertaken by the Board to both the faculty-forum and the Faculty Association Newsletter. Develop Communication Links with the BOG: The current situation, where members of the Board have virtually no opportunity to be informed by regular faculty members (other than the two on the Board) about issues of concern, is in my opinion completely unacceptable. To reiterate, a university structure where the administration serves as an opaque buffer between the governing body (the BOG) and the academic unit (the faculty) is hardly unique to SFU. Nor are the problems caused by rapidly expanding numbers of administrators with inflated salaries. Indeed, the problems are systemic and not a result of the particular individuals in charge. This entry was posted in Board of Governors and tagged Bob Russell, Dennis Danielson, Leonard Cohen. Bookmark the permalink.